Time and again the doom mongers claim that beards are no longer popular. But is this true? According to Google trends, they are still as relevant as ever. This proves the beard market is showing no signs of slowing down. There are several reasons for this, which I’m going to look at in this blog post. Traditionally, men have not paid much attention to their grooming regime. That has now changed. It’s a billion pound industry worldwide and is showing no signs of slowing down. Beard grooming is obviously a key part of this. There are now hundreds if not thousands of companies that sell products to help keep your facial fuzz looking its best. But there are two companies in particular that have helped to put beard grooming on the map – Beardbrand and Mo Bros.
Beardbrand, who are based in the US, were founded by Eric Bandholz and have amassed a huge following on social media. This is thanks in no small part to Eric’s personal brand. It has become so popular, that he has even had a beard style named after him! UK based Mo Bros have also helped to increase exposure of beard grooming. They appeared on the UK TV show Dragons Den where they received a £150k investment. This is only part of the story. They have continued to promote the bearded lifestyle on a regularly basis. One of their most successful tactics was paying men £30 an hour to have their beard stroked, which made national news in the UK. One thing’s for sure, both companies have significantly raised the profile of beards in popular culture. For that, we thank them! You may think that this statement is widely subjective. 51% of women prefer beards over all other kinds of facial hair. 82% of women think men look more masculine with a beard and over two thirds of the 82% said they would prefer to date a bearded guy over a clean-shaven man. 38% of women regard men not being able to grow a beard as a major turn off. It’s not enough to simply just grow a beard though – men are now taking beard grooming increasingly seriously. This explains the huge 226% rise in sales of beard care products, such as beard oils. No longer are men just happy to let their beards grow out wild. They now want to keep it looking its best. For themselves and the ladies. With beards and their associated products on the rise, it raises an important question. Has there been a knock-on effect on the sale of razors? In short, they have declined. Massively! Overall, companies have seen a 5.1% fall in the sale of razors. So, what has been their response? 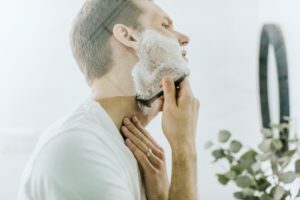 Last year, market leaders Gillette staged an “intervention”, by slashing prices by 12% on average and pushing facial-hair-maintenance tools such as beard trimmers instead. In other words, they have changed their focus towards beard grooming. If companies the size of Gillette are seeing the potential of this market, then things must be on the up! Unless you have been living under a rock, you will know that there was a UK royal wedding in May this year. Yes, Meghan looked fabulous. And the guy on the cello did a great job. But we’re missing the most important part of the day here – Prince Harry’s beard. Even before the big day, it was big news. There were numerous reports that the Queen gave Harry permission to keep his beard for the wedding. He required this approval due to the fact he was planning to wear an army uniform, which is usually not allowed. It’s fair to say that the decision was celebrated by the British public. The fact that Harry had trimmed his beard neatly has only added to the demand for beard grooming products. Although there are new articles appearing everyday claiming that the beard trend is over, the evidence suggests that this is not the case. So it’s clear – beards are here to stay and market is only going to get bigger.